Ugadi, the traditional Indian festival, celebrated as the New Year’s Day for South Indians, is just round the corner. It is time for you to jazz up the traditional outfit, as you celebrate ‘New Year’ with your family and friends. You can try out the following traditional looks for Ugadi. 1.HALF SAREE – This is undoubtedly, one of the extremely prominent traditional attire in South India. Also known as Langa Davani, this is popular among women. Half Sarees are either ready-made or got to be stitched. The material ranges from simple cotton to heavy embroidered silk. 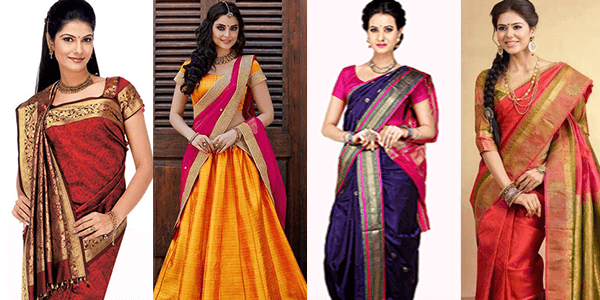 2.SAREE IN VARIOUS STYLES – Sarees never run out of style. You can try your Sarees in different styles like the elegant Kannadiga way, or the bold Marathi style, or simple Coorgi style and many other styles. 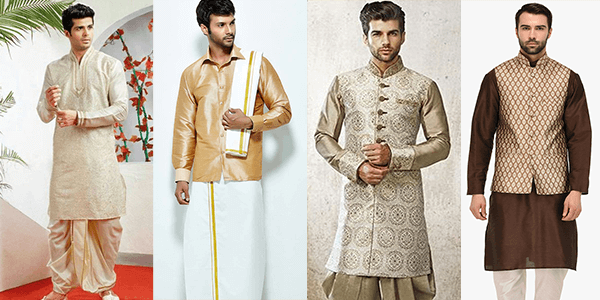 3.DHOTI – Dhoti or Panche, is the most popular style among the South Indian men. Silk dhotis worn along with silk shirts or Kurtas is one of the most traditional attire for the festive season. 4.SHERWANI / KURTAS – These are the most traditional Indian outfits among the men. Sherwani has come a long way. It’s not just a style, but also how a man carries his traditional outfit in a traditional and yet classy manner. Try out various styles like Chipkan Style, Achkan Sherwani, Angrakha Sherwani, Jacket Style, etc. Don’t worry if you got your traditional attire unwashed, dirty or stained. LaundroKart is always there for you. Try out our new service, roll polishing for your traditional outfits like silver and gold bordered Sarees, Salwars and Sherwanis.